*Expansive Sea Views has an easy open plan indoor outdoor flow, with fully opening sliding doors leading to a large deck for outdoor dining. This property sleeps 6 in the main house and 4 in the downstairs self contained studio. The main house has 3 spacious bedrooms, two with queen beds and one with 2 x singles. The bathroom has a huge bath to soak and relax in. The studio is down stairs with 1 queen bed and 1 bunk bed. It has its own kitchen and bathroom. Great for the extended family. 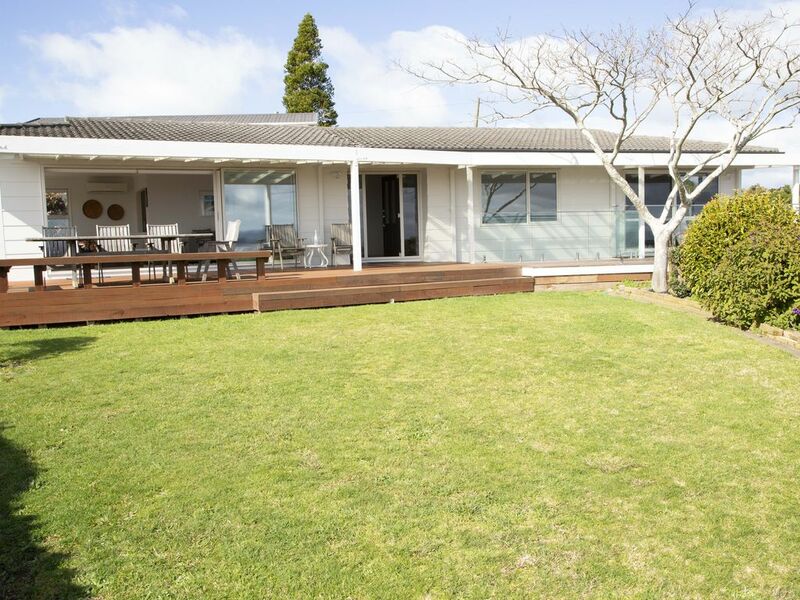 By the Sea at Maketu best suits extended families, families and couples wanting a peaceful break away. Short Walk to Beaches and Cafe. Maketu has much to offer, if you are a keen surfer the waves and surf are keen, if you love fishing maketu is the place to be. Maybe just a walk along Newdicks Beach which is located at the end of Townpoint Road will be great for your soul. Beach is approx 1-2 min drive or approx 5-7 min walk. For Golfers a fantastic course is approx 6 min drive. Horse rides also available in Paengaroa subject to bookings. I have heard great comments on these. On any day the Views are breathtakingly magnificent and Gorgeous Sunsets. "Maketu Seaside Cafe" / Restaurant: is located at Maketu on waters edge, Opening hours do change in winter, day / night availability. Centrally located, we are just a 10 min drive to Te Puke (past the golf club), 30 mins to Mt Maunganui and Tauranga (via toll road), or 40 mins to Rotorua and Whakatane – all excellent roads. If you need to refuel the boat BP is just 5 mins away. Linen is available upon request with a charge of $20 per person. A $300 security deposit is held for this property and will be returned to you following inspection by property manager after your departure. * Vaping and Smoking - outside only. * Suitable for mature guests and families only. * Highchair and Portacot available by prior arrangement - please advise if required. Local Beach Rental company. Shelley McCarthy Having already established a successful career as the Senior Property Manager with Professionals Real Estate, I have proven my ability to effectively manage multiple properties. During this time I managed the largest portfolio of properties in the company and made regular appearances on the TV programme, “The Renters”. As an organized, efficient professional with articulate business communication skills, I take pride in delivering quality service and conducting business with integrity. My natural and positive outlook supports my energetic approach to achieving objectives, which is complimented with the ability to quickly determine the needs of others. I am highly passionate about what I do and am committed to professionally act on your behalf to create mutual benefit to you as the property owner and to guests, accurately matching homes to suitably screened guests. Jody Beattie Administration and Marketing Manager I discovered Pukehina over 5 years ago and fell in love with the place. We came with the agent to see a 5 hectare block of land and never looked back! I have had experience in various different industries over the years, and am proficient at keeping many balls in the air at once. My role will be to keep the well-oiled machine working seamlessly by providing top quality administration support and office management. These skills combined with my passion for our piece of paradise will ensure that everything is completed efficiently and with a smile. With its panoramic views and comfortable beach style. This property will have you feeling refreshed in no time at all. You can bring your whole family and get away for a well deserved break. Maketu beach has allot to see and and explore our gorgeous little piece of paradise. Large private property. Large house + extra studio that sleeps 2 adults and 2 children. Breakfast bar with four stools. Room for boat parking and boat ramps not far away. Stunning ocean and rural views and a short stroll to the ocean. Lovely home (sleeps 6) with attached separate fully contained studio (sleeps 4) House can be rented without attached studio for a discounted rate. Please enquire.